Advices about beauty vision, skin and health care, fashion and style. In many ways, pigs resemble humans. So Danish researchers are utilising them in a large-scale project where “model pigs” will provide new insights into human diseases such as Alzheimer’s, atherosclerosis and psoriasis, writes Jan Aagaard in magazine Focus Denmark Nr. 3 2010. We might not like the thought. But the fact is that pigs resemble humans in more ways than we think. So it makes sense to use pigs when researching into human diseases. This is the background for a series of spectacular projects jointly initiated by the Danish food industry, the pharmaceutical industry and the research community. The aim is to research into the pig’s genetic makeup and use this knowledge to learn more about both porcine and human diseases. In the part of the project which concerns human diseases, attempts are being made using gene technology and breeding to create “model pigs” which are particularly predis-posed to diseases that usually only affect humans. These model pigs could then be used by the pharmaceutical industry in the development of new drugs. Pigs are in many ways more suitable for medical testing than “traditional” research animals such as mice, rats, rabbits, monkeys and dogs. Several of the pig’s organs are very similar to human organs, and the physiology and metabolism of the pig are relatively close to that of humans. At the same time, pigs reproduce well, grow quickly and are easy to handle. A pig. Photo by www.sxc.hu. 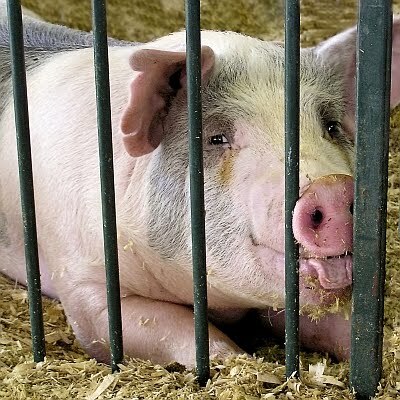 Researchers are therefore using pigs to create models for a number of diseases for which they have failed to create models using smaller animals. American researchers have developed a genetically modified pig model for the hereditary lung disease cystic fibrosis – a disease for which it has not proved possible to develop an animal model using mice, despite numerous attempts. Disease models in pigs have also been established for osteoporosis and diabetes. In the Danish project, researchers are seeking to develop model pigs for testing drugs and treatments for diseases including arteriosclerosis, psoriasis and, not least, Alzheimer’s. In the Alzheimer’s and psoriasis projects, use is being made of special “minipigs” whose ancestors are Vietnamese pot-bellied pigs. These pigs, which come from the Danish company Ellegaard Gøttingen Minipigs, are well suited for experimental purposes because of their small size. The project with Alzheimer’s model pigs began in 2005 and after just two years caused a stir when the researchers created the world’s first cloned “Alzheimer’s pigs”. Seven identical pigs came into the world equipped with a gene that in humans produces a hereditary variant of Alzheimer’s disease. Since then, several of the cloned pigs have become gestant by natural means and have given birth to healthy and viable piglets. Today there are over 20 transgenic pigs available to the project. Getting the cloned pigs to reproduce naturally was an important milestone, as it would be too expensive and uncertain to base production of model pigs solely on cloning. The original cloned pigs are now three years old, but the researchers are still waiting for the big breakthrough. Even at two years of age, the pigs have shown no sign of brain changes of the type seen in people around 10 years before they are diagnosed with Alzheimer’s. “We originally hoped that we would see these changes in the pigs in one to three years, on the assumption that the age of the pigs would correspond to a human age of about 35 years. This is the earliest time that changes can be seen in the brain that progress to the depletion of brain cells in Alzheimer’s patients,” says project leader Dr. Arne Lund Jørgensen of the Department of Human Genetics at Aarhus University. “How pig age translates into human age is a contentious topic, so for now we need to remain patient. At the same time we are endeavouring to accelerate the disease process, by creating pigs that have not one but two gene mutations that can lead to Alzheimer’s,” says Arne Lund Jørgensen. Investigations into whether the transgenic pigs are showing preliminary signs of Alzheimer’s take place in several ways. Behavioural tests can show changes in the pigs’ memory, and the Danish researchers have also developed a test that can detect changes in the pigs’ sense of smell. The tests are performed while the animals live a fairly normal pig life in the stall. In addition regular scans of the pigs’ brains are carried out and, once a year, one of the pigs is slaughtered and its brain studied using microscopy. As this article was being prepared, the researchers were planning to slaughter and analyse a 3 year old pig. “We hope to see changes in this pig’s brain, or in some of the others in the next few years. A disease model in pigs would provide unprecedented opportunities for identifying the Alzheimer’s process and testing new drugs,” says Arne Lund Jørgensen. At the same time, he stresses it is not certain that the pigs will develop Alzheimer’s. In parallel with the Alzheimer’s project, other Danish researchers have created pigs with genes that can cause atherosclerosis, just as “psoriasis pigs” are on the way.